Battle of the Becels: Can you taste the difference? My coworkers and I were so shocked with the results of the butter vs. margarine taste test that we decided to take the margarine taste test to a whole other level. Seeing that margarine can taste and perform very similar to butter, we wanted to try the different types of Becel margarine (there are 9 different types) and see if we could tell the difference. I always thought that margarine was just a healthier alternative to butter, but seeing that there is Becel buttery flavour, olive oil, etc I was wondering – is that really necessary? What do they taste like and can you even taste a difference? But I am especially interested in trying their ‘salt and calorie reduced’ varieties. Is there a compromise in taste and flavour? Who would have thought that there would ever be so many different kinds of Becel! I am really curious to try these out. I would guess that the salt free, light and 64% less (especially this one) will be easy to identify – but who knows. 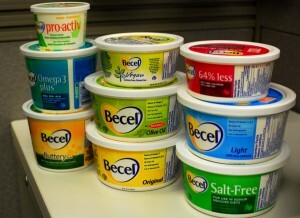 Becel is a pretty good product so it will be interesting to see if people can tell the difference between the types. Who knows – maybe choosing a healthier type of fat doesn’t have to be such a big sacrifice. Please try all the different types of margarine and list which one you think is which. Which one do you like the most? All of the Becel margarines tasted pretty much the same except for sample D (buttery taste) and I (salt free). I was quite surprised that the calorie reduced varieties – Light and 64% Less tasted just like Becel Original. I guess choosing a lower calorie margarine doesn’t have to be so bad. Except Becel Salt Free (which just tastes awful – and no, it doesn’t taste at all like butter). All of the taste testers had a difficult time trying to decipher between the different types of margarines. They reported that they all tasted pretty much the same except for a couple exceptions (the salt free becel and the buttery flavour Becel). I was personally very surprised with the 64% Less, Light and Vegan varieties and how close they tasted to the original. But seeing that they all tasted pretty much the same, is it really necessary to have that many different types of margarines? The next test is to see how they perform while baking! This should be interesting. « Food Lab: Devil`s food cake (cake mix vs. from scratch)	» Battle of the Becels Part 2: Do some perform better in baking than others? But really, who knows??? Kudos to anyone who's palate is sophisticated enough to tell them apart! Otherwise I can't really tell a taste difference. All taste salty except the salt free one so it might help mask the taste of their being less fat. Looking forward to seeing how they do in cookies. Some are not recommended for some baking so we'll see if there's a difference due to their properties! Thanks, I've now had my 2-3 Tbsp of unsaturated fat for the day! Well I wasn't very good at distinguishing between the different types of Becel. The only thing that I noticed is that Sample D had a very strong taste. Sorry – I've got nothing else to report! Some of these were tough – they just tasted too similar. A: Couldn't tell the difference between A and F. Light? D: Original? Saltier and a bit richer and A and F.
F: Like I said, couldn't tell the difference with A.
G: Pro Activ – you can tell by the colour and glossiness right away. H: I have no idea. Vegan? I: Funny off taste. Either Omega-3 or Vegan? Never tried Vegan Becel so have no idea what it tastes like. Or maybe it's Salt-free! Whatever this one was, it was gross. I honestly can't taste a difference between any of them (except for D which has a strong butter like flavour and I which tastes awful). I would think that I is the 64% less or the Salt Free Becel. Other than that, the rest all taste pretty much the same and I'd be fine with any of them.